Sammy Hagar and The Circle performed the 1988 Van Halen classic, “Finish What Ya Started”, during an April 9 appearance on The Howard Stern Show on SiriusXM. 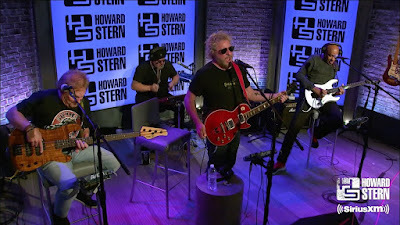 “The only song I ever played on a Van Halen record was this song…I played rhythm guitar,” says Hagar, while explaining he wrote it with Eddie Van Halen when the guitarist showed up unexpectedly at his place late one night while he was entertaining a guest; by the time the pair wrote the tune and the Red Rocker went back inside, his friend was asleep and the experience resulted in the song’s lyrics. The third single from Van Halen’s eighth record, “OU812”, was a US Top 15 hit while the project delivered the group their second consecutive No. 1 album in the States. Hagar and company were on hand to promote “Can’t Hang”, the new single from the group’s forthcoming album, “Space Between”, and the April 19 launch of a spring tour in support of the project. Due May 10, the set marks the first full studio release by the band, which also features bassist and former Van Halen member Michael Anthony, drummer Jason Bonham and guitarist Vic Johnson. Following Hagar’s 1996 exit from Van Halen, he reunited with the group for an ill-fated 2004 tour behind a greatest hits project.